Over the last few days, we have seen the tragic loss of life in Gaza, as well as continued threats in relation to North Korea and its nuclear weapons talks. The prospect of widespread violent conflict in the Middle East, or even a war between nuclear states, is something that gives rise to fear in many people’s minds. We must pray for the end of violence, and for the prevention of a great war of the world. Peace is beautiful – perhaps too beautiful, because it’s so pleasant that we are at risk of taking it for granted. From one perspective, this extreme relaxation or laziness in times of peace is the principle cause for war. War is inevitable the moment we ignore the value of peace. It is therefore imperative that we are more alert when we experience peace. Otherwise peace-time will be the birthplace of war. Of course, we do not need to panic, but we must be vigilant. This is one of the reasons why Buddhists practice meditation – to remain vigilant and acknowledge the value of peace. People of all backgrounds have different practices, different customs, different rituals in their lives that they cherish: whether we are meditating, praying to a deity, worshiping Mother Earth; even the practice of cherishing friends and family, peers, and colleagues – no matter what our beliefs and practices are, we should utilise them to help us realise and appreciate what we have, so that no size or scale of disharmony may be generated in our hearts. In this moment, if you are experiencing a good amount of peace, please cherish it – do not ignore it or take it for granted. Our true nature lies in peace, not war. As Buddhists, we experience this, we understand this, when we meditate. I have heard it said that prayer or meditation is of no use, and that what is required is ‘real action’. From a Buddhist perspective, we understand that prayer is not inaction, but a powerful and beneficial form of action. Prayer not only keeps us vigilant and appreciative of peace – it is a source of peace. Diplomatic talks and foreign relations will only be successful if they are rooted in the sincere aspiration for the prevention and cessation of violence. This aspiration, this prayer, is the root that enables peace to flourish. When we pray together, we accumulate merit that has benefit for all sentient beings. Therefore, let us all pray together for the end of violence and its causes. Let us pray for peace. Firstly, I wish to express my heartfelt appreciation for all of your messages on the occasion of my birthday. Please use this opportunity to consider participating in the practice of Nyungne. 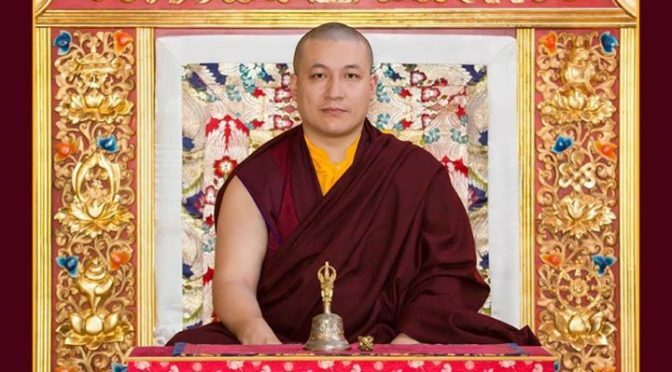 This profound practice of the Thousand-Armed Chenresig, the Buddha of Compassion, has great benefit – not only for the practitioner, but also for the Buddha dharma in general, and our Kagyu lineage in particular. Therefore, I encourage all of you to participate in the Nyungne practice as much as possible, for the benefit of our precious lineage.